Established in 1973, Redleaf Press is a leading nonprofit publisher of exceptional curriculum, management, and business resources for early childhood professionals. 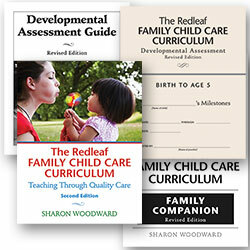 This starter set includes The Redleaf Family Child Care Curriculum, Second Edition, 10 copies of The Redleaf Family Child Care Developmental Assessment, Revised Edition, 10 copies of The Redleaf Family Child Care Curriculum Family Companion, Revised Edition, and The Redleaf Family Child Care Developmental Assessment Guide, Revised Edition. Each child develops at a different rate, so it is important to view this development against a series of benchmarks or milestones. By recording a child's progress through a series of milestones, you can determine if the child is on track and developing normally. 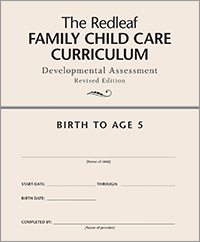 The revised edition of the Redleaf Family Child Care Curriculum Developmental Assessment lays out the milestones and provides space to record the dates when the child begins moving towards, achieves, and finally masters them. It is a valuable and easy-to-use tool to record the child's development. Use the assessment on its own or combined with the Redleaf Family Child Care Curriculum, Second Edition. 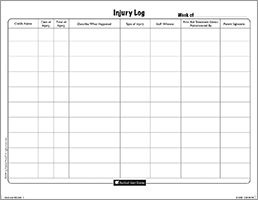 Document injuries on these weekly sheets by recording relevant information in designated areas. Each tablet is 3-hole punched and has 55 formsa year's supply.